In this video of Ajax versus Real Madrid, accompanying an article, you can see around 2:22 that there was much controversy about a ball being out or not. With the help of the VAR it was decided after about four minutes that the ball was in. In my eyes though, the ball was clearly out. It was said that was because of the angle we looked at it. The point of contact of the ball with the grass was clearly over the backline of Real Madrid. Now, is it the point of contact that counts, does the ball have to be over the line with its full diameter or what, to make the decision that a ball in football is out? 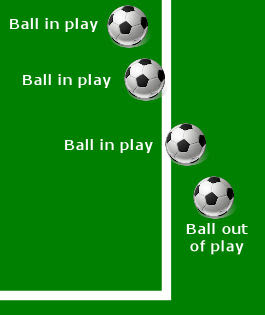 (...)when the whole of the ball passes over the touchline, on the ground or in the air. This also counts for all other similar situations (goal, corner, etc).